Hello,I accidentally deleted all photos from my camera, in fact I only want to deleted one that looks not good. But now all the photos for New Year's Eve and Christmas are deleted. Worst of all, the photos from a recent tconvert to the British Virgin Islands to celebrate our dad's 70th birthday are gone! What should I do! Any way to undelete photos from memory card? Any help will be great appreciated!Thanks!!! Sounds familiar? This almost happens to everyone. So don't panic. You're not alone, and there is the way indeed to help you undelete pictures from memory card. The MOST important thing that you should burn into your heart is: Stop taking any photos immediately with your camera or other devices holding your memory card. The space occupied by the deleted photos are only marked as free to new photos. If they are not overwritten by other files, you can easily recover them. Therefore, it's very important to keep your memory card original after you lost your photos. Next, let's check how to recover deleted photos from your memory card in steps. Besides protecting your memory card well, you also need a photo undeleting tool to help you find back your deleted pictures. You can try Wondershare Data Recovery and Wondershare Data Recovery for Mac if you are using Mac OS X. 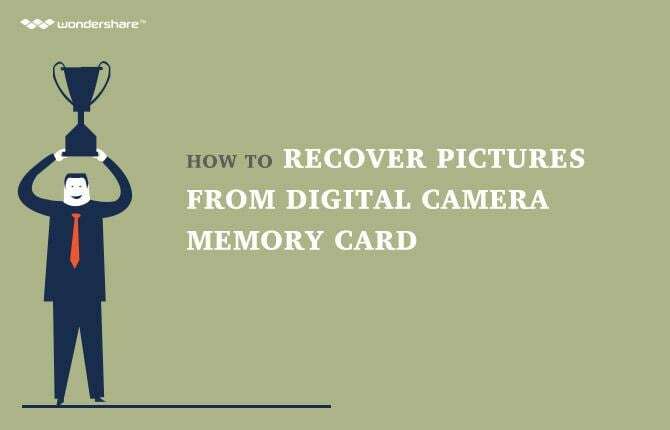 This memory card recovery software supports all common formats for your pictures, as well as the recovery from different devices such as camera, camcorder, iPod, usb drive, mobile phone, music player, and more. Connect your memory card or camera to the computer and make sure that your card can be detected. Run Wondershare Data Recovery and follow the next steps to perform memory card data recovery. Step 1. To recover deleted photos from memory card, you can go to select the option "Photo" to start. Step 2. Select your memory card to scanning lost photos, and click "Recover" to start. If quick scan can't get your lost photos, you can go to deep scan which will deeply search more lost files. Step 3. Preview the files and begin to recover photos from memory card.